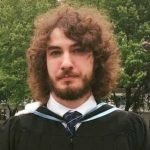 My name is James Collacutt and I am a mostly self-taught multi-instrumentalist and composer from Mississauga, ON! I play guitar, bass, drums, and (some) piano in both solo projects, and in bands with my friends, and I use Ableton Live to record the original music that I compose! I am very passionate about teaching and learning about music and I promise that I will work my hardest to ensure that you are developing as a musician while enjoying yourself and playing the music that you want to play!